We here at Riff Relevant are no strangers to the Warsaw, Poland-based trio WEIRD TALES, having reviewed their first physical release, ‘The Fall’, HERE in April, 2018. 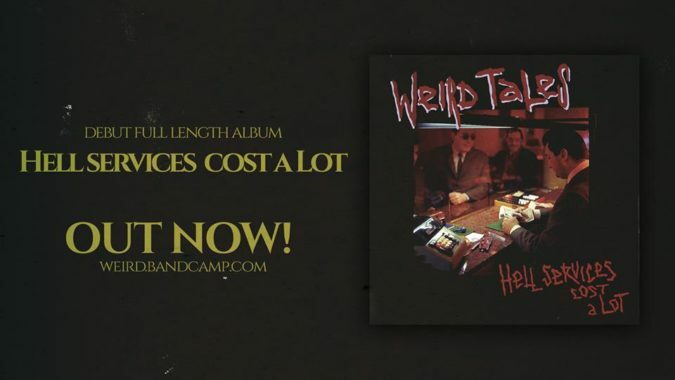 Now they have returned with a new full-length album, ‘Hell Services Cost A Lot‘, with this latest chapter in the ongoing saga finding musicians DIMA (guitars / vocals) and KAVA (drums) joined by new bassist / vocalist KRISS. Unified upon the expanses of the album’s seven tracks, this triad completely immerse themselves, and ultimately the listener, within deep recesses of dense, fuzz-rich psych-doom and sludge. With a clearly straightforward, no-nonsense determination to deliver their most stellar effort yet, down-tuned riffs and blunt rhythms are wielded like weapons of war. They are handled with precision in the rigorous heaviness of cuts like the nearly 11-minute “Madness” or the grooving tempest “Warning“, and take us through their paces intact. Doing so with things like raucous vocal deliveries from the shadowy ether and the occasional tinting of synths here or there, serving as solid additions to these tracks. Each of these songs seem to exude foreboding nuances, some more than others, and especially ones like “Crawling Pain” or “Nightmare“. The mysterious unknown lingers just beneath the surface of each, their staunch haze of guitar, drums, bass, and vocals an unyielding wall of disturbing, impenetrable intensity. To me, the album’s best and most wicked compositions come in the form of (the all capitalized) “LIE“, the lovely titled “Bitchcrusher“, and the closing number “Dead Man“. Each has a little something-something extra to it, starting literally with “LIES“, as it begins with some bluesy harmonica before giving way to a monstrous riff. Stripped down, it lingers before exploding into a rolling dynamo of odious Sleep influenced mass… one with exceptional drum work, I might add. However, as good as that was, we will eventually encounter “Bitchcrusher“, a rut-scarred juggernaut with a quickened advance. It also contains a slightly different vocal approach, one that is more monotone and lacks much of the aggressive hues of other songs. In time, the track disperses some fierce guitar solos that act as a turning point toward tighter jamming amid a cacophonous deluge of fury and feedback. “Dead Man“, the song that closes this album, is a bit more experimental it seems, having a uniquely exclusive feel to it unlike the others. Subtly more melodic, even tranquil at times, this is the trio’s foray into full-on, fuzzed-out doom. Lumbering with a molasses-like ooze of labored plodding, this slow crawling slug of doom possesses a simple feel to it, only briefly picking up periodic speed here and there. Man, dead or not, “Dead Man” is certainly a superb stand out. Trust me, you cannot, will not, in no way go wrong with ‘Hell Services Cost A Lot‘ from WEIRD TALES. If you dig fuzzy, sludgy, doom music with bleak undercurrents and crushing elements rising up from it, this is the album for you. Take that literally, because not only can you stream it above in this review, but you can go to Bandcamp [HERE] where it is currently available as an NYP (Name Your Price) download.